SCF Board Chairman James Segura does the honors at the ribbon cutting Sept. 11. 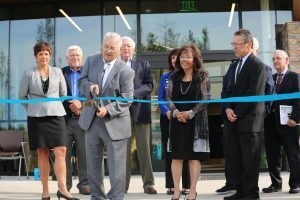 With one swoop of oversized scissors, Southcentral Foundation’s Board of Directors Chairman James Segura symbolically opened the newest building on the Alaska Native Health Campus: the Dr. Katherine and Dr. Kevin Gottlieb Building. The five-story addition will house a variety of services focusing on family wellness. “The Dr. Katherine and Dr. Kevin Gottlieb Building is a testament to Southcentral Foundation’s dedication to helping the next generation of Alaska Native people thrive. I applaud the team here today not only for the commitment to customer-driven health care excellence but for truly never losing sight of what it’s all about: helping families live a long healthy life together,” said CIRI’s President/CEO Sophie Minich. Culminating five years of work, the Gottlieb Building will expand dental, OB-GYN, maternal fetal medicine and gyn-oncology services to customer-owners, as well as provide innovative equipment for the Alaska Cleft Lip and Palate program and the Dental Assisting Technology program. The fifth floor will house the new services of the Child and Family Developmental Services clinic, the first developmental clinic in Alaska. The CFDS clinic will provide fully integrated behavioral and developmental services in such a way that it is anticipated to be a pioneer of the field. Among the speakers, Jon Stolle, principal architect and Jerry Neeser, President of Neeser Construction, talked about how the natural beauty of Alaska heavily influenced the building design, while the independence of Alaska Native culture helped set the atmosphere of the space. At the ribbon cutting the Gottliebs were surprised with two gifts from SCF’s Board of Directors, a dedication monument that welcomes visitors, and a plaque by the first floor elevators outside the dental clinic. The indoor plaque hints at the personalities of the Gottliebs: a plane emblazoned with the same call numbers as the Gottliebs’ plane flies over a pair of Alaskan bears, a favorite animal of the couple. Additionally, the biggest surprise came when Jerry Neeser committed $50,000 to SCF’s Soldier’s Heart program, which serves the veterans and first responders of Alaska. Inside the dental clinic, a special plaque recognizes the years of dedication Dr. Tom Kovaleski has given to customer-owners and to expanding the services SCF offers. Dr. Kovaleski was one of the original dentists with SCF and has been building relationships with customer-owners for more than 20 years. Throughout the event, the excitement and anticipation of the doors opening to such a unique facility was felt. SCF Dental opened for services in the Gottlieb Building on Sept. 26, while the remaining services opened Oct. 1. The newest addition to the campus provides a much-needed expansion for partnerships with customer-owners. To view the ribbon cutting ceremony in its entirety, visit the SCF Facebook page video section for the live feed video. For more information about the building and the services provided, visit southcentralfoundation.com.